Playacar Palace (Playa del Carmen). This resort will appeal to visitors looking for a very modern and contemporary all-inclusive. It’s a great choice for couples, families, and groups who want amazing food and a luxury experience, as well as varied entertainment without a crazy/party/spring break atmosphere. For families with children, there is a kids’ club and child care on-site. 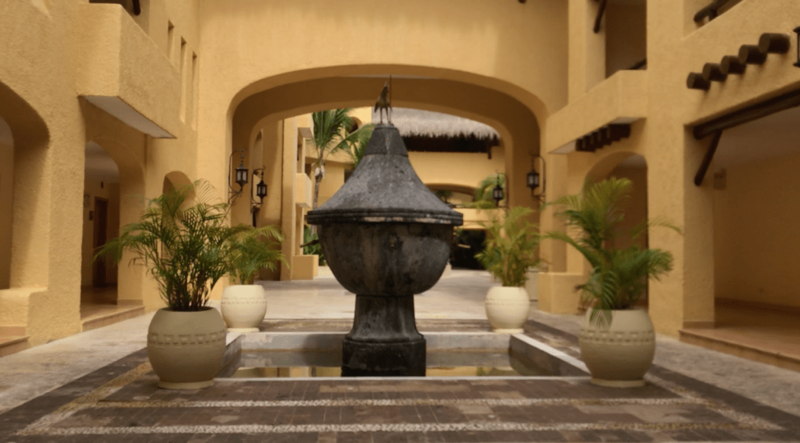 Playacar Palace has two accessible rooms, one with a king bed and the other with two doubles. There is flat-entry (ocean view) balcony access, space under the bed for a lift, and the beds are 28 inches high. Both bathrooms have a roll-in shower with a stand-alone shower chair, raised toilet, and toilet/shower grab bars; however, the sink is not roll-under. The resort has an accessible shuttle to take guests to neighboring sister properties and ramped beach access. There is no pool lift and no beach wheelchairs on-site; however, these can be rented. Iberostar Maya (Playa del Carmen). This resort is part of a sprawling complex that includes three other Iberostar properties. They are showing their age a bit, and I would not consider this a luxury property. That being said, it’s very family-friendly, has quiet spots and louder party areas, and with shared access to multiple properties for guests, there really is something here for everyone. For families with children, there is a kids’ club and child care on-site. The Maya resort has five wheelchair accessible rooms; all five have king beds and bathrooms with roll-in showers. All five also connect to a non-accessible room. There is no ocean view, but there is patio access. Beds are 27 inches high and there is space under the bed for a lift. Showers have a stand-alone chair, roll-under sinks, no raised toilet, and toilet/shower grab bars. There are no pool lifts; however, there are multiple zero-entry pools (including a huge wave pool). There is ramped beach access and wooden beach walkways, but no beach wheelchairs on-site; however, these can be rented. Iberostar Paraiso Beach (Playa del Carmen). 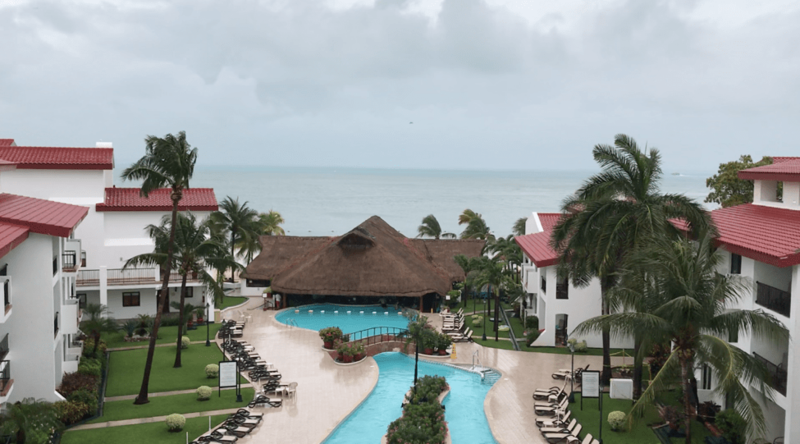 Despite being considered a more budget-friendly property than neighbor Iberostar Maya, Paraiso Beach (in my opinion) has a more luxurious feel to it, with curtain-draped beach loungers and shiny columned walkways. 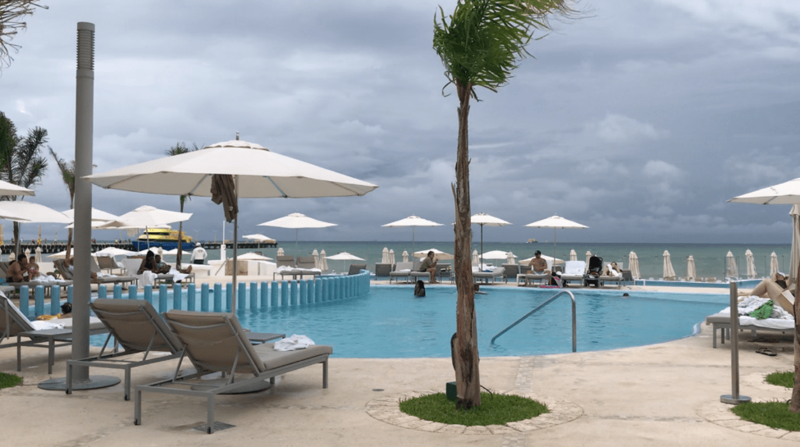 Guests here can use the accessible pools and features over at Maya, although the accessibility at Paraiso’s beach – including designated accessible lounge areas and toilets – is truly phenomenal. This resort has six accessible rooms, three with one king bed, three with two double beds, and all with roll-in showers and connecting rooms. There is no ocean view, but there is patio access. Beds are 24 inches high and there is space under the bed for a lift. Showers have a fold-down bench, roll-under sinks, no raised toilet, and toilet/shower grab bars. There are no pool lifts; however, there are multiple zero-entry pools (including a huge wave pool at Iberostar Maya). There is ramped beach access and wooden beach walkways, but no beach wheelchairs on-site; however, these can be rented. Iberostar Cancun (Cancun). This all-inclusive resort was formerly owned by Hilton, and it shows in its largely ADA compliance. 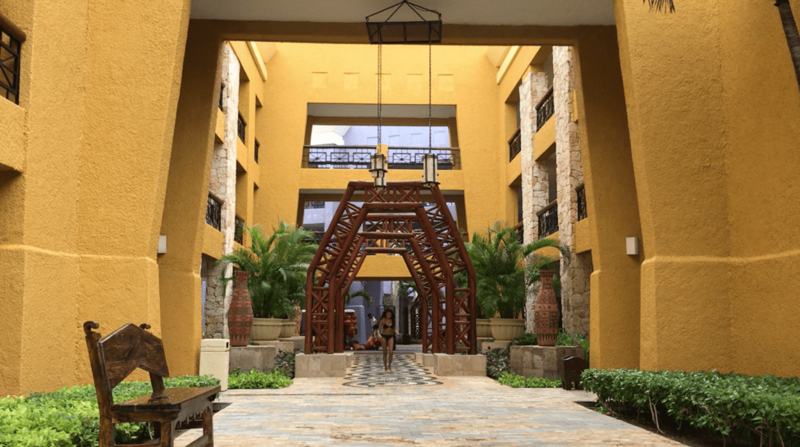 It feels more like a large luxury hotel than a sprawling all-inclusive like in Playa del Carmen, so this may be better for guests not interested in wheeling across a huge property. The decor is very modern and feels more American than Mexican, as a heads up for those looking for a more authentic Mexican ambiance. The resort has five accessible rooms, all with two queen beds and connecting to regular rooms with a king bed (perfect for families). Beds are 25 inches high and there is space under the bed for a lift. Three rooms have roll-in showers and two have accessible tubs. Showers have a stand-alone chair, no roll-under sinks, no raised toilet, and toilet/shower grab bars. There are no pool lifts, but there is a ramp to the mid-pool bar. There is wide ramped beach access, but no beach wheelchairs on-site; however, these can be rented. Hard Rock Hotel Cancun (Cancun). Make no mistake; this is where the party is! The music starts the second you roll through the lobby doors and doesn’t stop until you go home. In standard HRH fashion, the public areas are filled with rock ‘n’ roll memorabilia, fun activities, and bars for days. This was easily the busiest resort of all ten that I visited, but the storm outside was also driving a lot of people indoors who would normally be partying in the pool or on the beach. There are ramps everywhere, with easy access to restaurants, bars, and shops. The HRH has four well-appointed accessible rooms, two with a king bed and two with two double beds. Beds are on the high side at 29 inches and sit on a platform, so they cannot accommodate lifts or be lowered. Balconies are large with ocean views and flat-entry access. All rooms have a roll-in shower with built-in seating and grab bars, although the shower head is fixed and right above the center of the seat (a shower chair should probably be requested). The bathroom has a roll-under sink and no raised toilet (but has grab bars). There are no pool lifts and no ramped beach access; however, hotel employees will gladly carry disabled guests to the sand if they wish to be transferred to a rented beach wheelchair. Royal Hideaway (Playa del Carmen). This quiet getaway is a beautiful property with named buildings separated by little wooden bridges. The property itself is very accessible, with lovely restaurants, ramped beach access, and even a beach wheelchair on-site. It is very quiet, although it has its own theater and daily entertainment and live music. The big (and only) problem? The toilet room. Royal Hideaway has four designated accessible rooms, two with one king bed and two with two double beds that are 28 inches high and have space for a lift. There is also ramped patio access. The bathroom has a roll-under sink and a roll-in shower with grab bars and a stand-alone chair. However, the small room that contains the toilet has a door that opens inward, with hardly enough room for an able-bodied person to squeeze through because a towel rack blocks full opening. There are also no grab bars next to the toilet. I mentioned to the villa concierge that the door needs to open outward and grab bars need to be installed; however, I have no way of knowing if or when this will be fixed. Iberostar Paraiso Lindo (Playa del Carmen). This is yet another sister property of Maya and Paraiso Beach, so it shares the same public space accessibility as those two properties. For families with children, there is a kids’ club and child care on-site. However, once again the bathroom is the problem. This resort has has five designated accessible rooms with beds that are 26 inches high and have space for a lift. There is also ramped patio access. The bathroom has no roll-under sink and a roll-in shower with grab bars and a fold-down bench. However, the toilet has two fixed grab bars, one on either side, that prevent any lateral transfer and leave barely two feet of space for an able-bodied person to reach the toilet in the space between the bars and the wall. Removing the bar on the non-wall side of the toilet would make this bathroom accessible, but I have no way of knowing if or when this will be fixed. Paradisus Cancun (Cancun). This is a very modern resort that reminds me of a W hotel in the US. 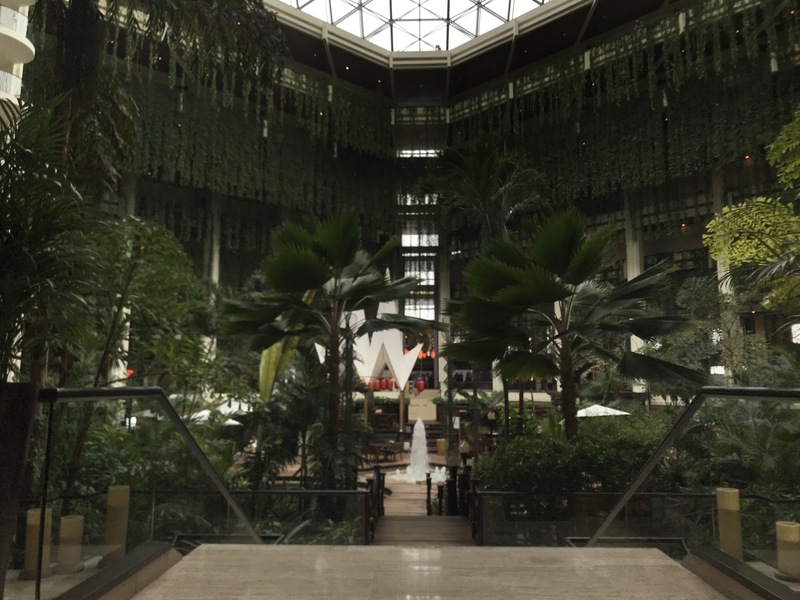 It’s a big complex with four pyramid-shaped buildings, a nightclub, lounge, and multiple modern restaurants. For families with children, there is a kids’ club and child care on-site. The Paradisus has four accessible rooms, one with a king bed and three with two double beds that are 25 inches high and have lift access. The lip to access the balcony is about two inches high and has no ramp. However, the bathrooms are large with roll-in showers with stand-alone chairs, roll-under sinks, no raised toilets, and shower/toilet grab bars. The problem lies with the public areas. The center of the main building has several eateries and cafés, but are only accessible via stairs. The spa is not accessible, either. There are no pool lifts and no ramped beach access. There is also no accessible toilet in any of the public areas. 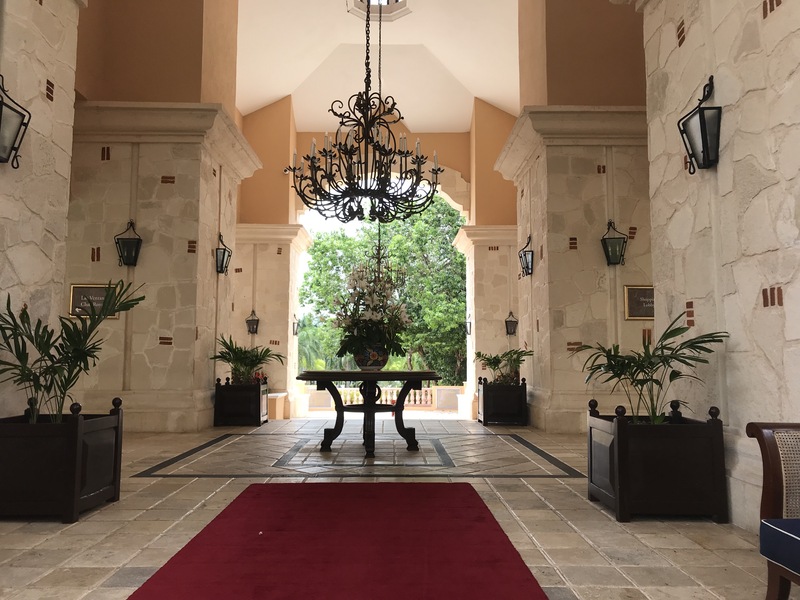 It’s a beautiful resort and the accessible rooms are fantastic, but it’s hard to justify the all-inclusive price when you can’t access much of it unless you can walk at least a few steps. 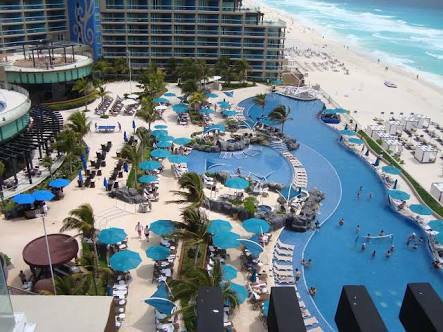 Royal Sands and Royal Cancun (Cancun). I’ve lumped these two properties together because they’re more or less the same. These resorts are time shares that rent out owners’ rooms when they’re not being used. The rooms are like condos with space for six people, a dining and living area, balcony, and full kitchen. The problem is that there isn’t a single designated accessible room at either resort. 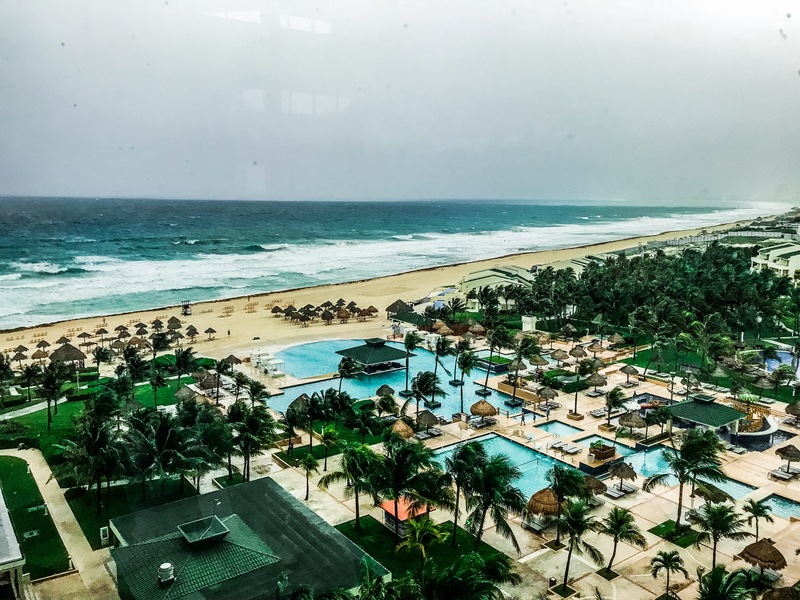 However, as odd as it sounds, the properties are incredibly wheelchair friendly in all the public areas, with ramped beach access, accessible toilets in the lobby and by the beach, and even a VERY rare pool lift at the Royal Cancun. They are extremely quiet properties ideally suited for seniors. The rooms have space to maneuver in a small scooter (I was able to get through all doorways) or a chair that can fit through a standard doorway. The beds are 22 inches high at the Sands, which has pullman beds and connecting rooms, and 25 inches high at the Royal Cancun. The sink area is large, but the toilet and bathtub (with one grab bar) are standard in a small room. These resorts would be ideal for groups or multigenerational families with minimal mobility issues. 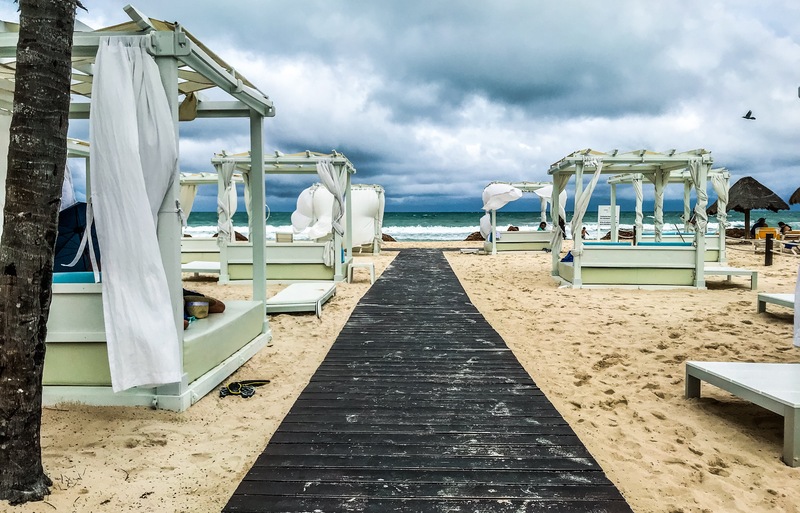 Neither Playa del Carmen nor Cancun are places for wheelchair users to go wandering around. Resorts in Playa are WAY spread out, so you’re intended to stay on the property. Sidewalks in Cancun are not in great shape, curb drops are very steep and inconsistent, and curbs are extremely high. Rolling in the street is NOT an option. Ramps are very steep everywhere, including inside resorts. Make sure your batteries are fully charged every day and manual chair users have some help. Purchase travel insurance if Mexico is your destination! There is no guarantee of top quality health care and your domestic medical insurance will not reimburse you. You also often need to pay cash up front before receiving treatment in Mexico. 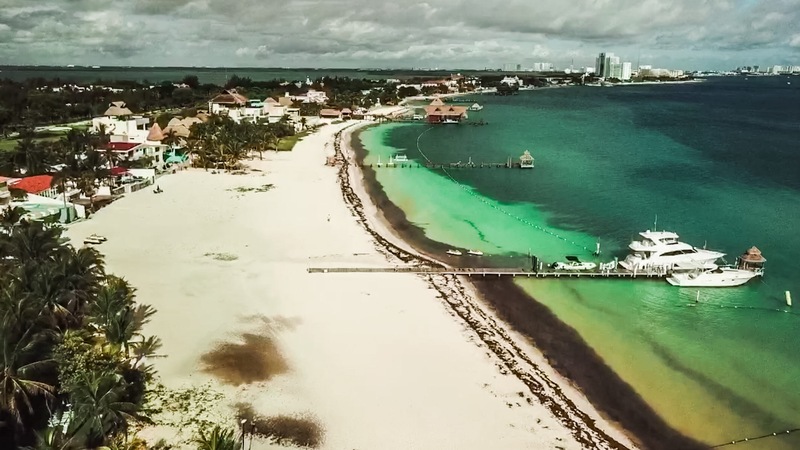 There is one company based in Cancun that offers wheelchair accessible airport transfers, tours, and beach and medical equipment rental. 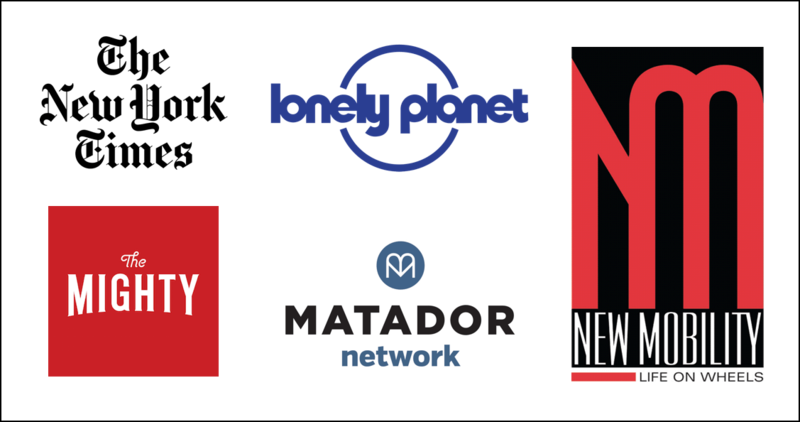 If you book your resort stay through me, I will help you arrange for any of these. The Mexican people are extremely friendly, service oriented, and ready to help you at the drop of a hat. Resorts may not fully meet ADA standards, but Mexicans fully understand the concept of where there’s a will, there’s a way. Most Mexican all-inclusive resorts will not guarantee an accessible room if you book directly with them. PLEASE LET ME BOOK FOR YOU or use another accessible travel specialist to guarantee your accessible room! It won’t cost you one cent extra and I can get you the lowest available rate. Are you ready to book your accessible all-inclusive adventure in Mexico? 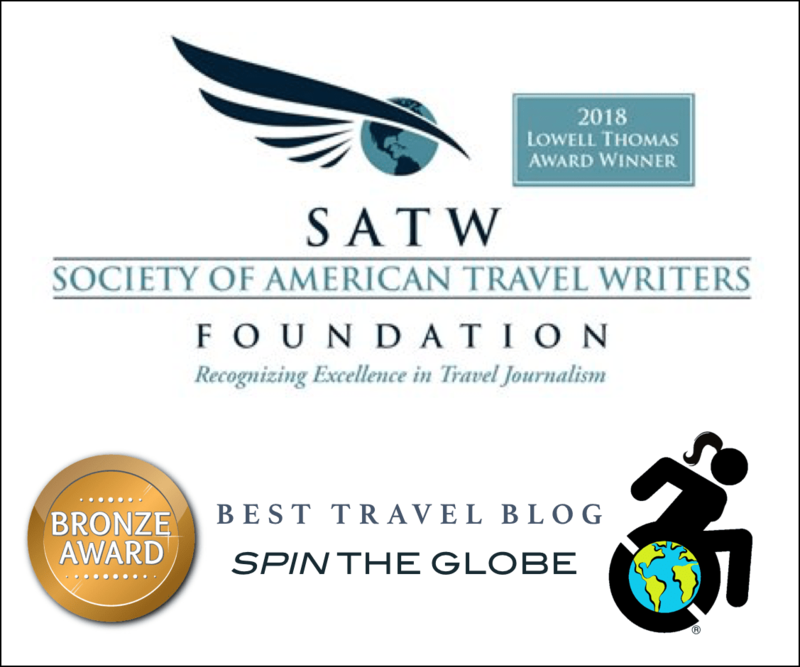 Contact me at Spin the Globe/Travel and we’ll get started! I wanted to stay in Playa but since Im in a Electric wheelchair I don’t know. I want to be able to go to 5th Street where everyone walks around. How would I get there? I see the Royal Playa De Carmen Hotel is near 5th street. Could i drive my chair from there?